When it comes to natural beauty it's hard to beat the look and warmth of a real hardwood flooring. At Rebasco Decorators, we carry all today's finest hardwood styles and colors in our showroom and with every purchase we offer expert installation. From 3/4" solid oak, maple, and many other hardwood species, to the prefinished engineered or floating wood floors, we can help you choose the right wood floor for your decor, and lifestyle. The engineered and longstrip hardwood floors can be installed on any level of the home, including in the basement if moisture isn't present. They can also be glued down, floated over, or nailed down to most the subfloors. While the 3/4" solid hardwood floors are generally recommended for above grade installation only, and have to be nailed to the subfloor. 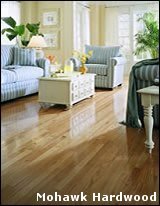 Any of these floors can be refinished if they become severely scratched, or dull from normal wear and tear. Choosing a hardwood floor can be confusing, so let our expert staff help you decide which wood floor is right for your home.